When I was growing up, summer was my favorite time of the year. There was no school, we played outside all day, and I got to stay up late. However, as I’ve grown older and no longer have my summers off, I have grown to really love spring. All winter we stare at brown grass, bare trees, and endure freezing temperatures, but when spring comes along, there is a certain feeling that comes along with it. Grass starts turning green, flowers begin to bloom, and trees start to fill out. There are warmer temperatures and frequent rain showers. To me, this is beautiful because it represents something new and fresh. It’s almost like God is breathing life back into His creation. 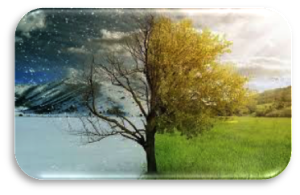 I don’t think it’s a coincidence that our seasons go through the process of life and death. I am a believer that God did that on purpose to remind us of our own fragile lives. When we are young we are exuberant and full of life, but as we grow old our bodies begin to break down and eventually even shut down. What’s interesting to me is that our spiritual lives are the exact opposite. As we grow older and our bodies begin to break down, often that’s when our spiritual lives begin to soar. It’s no secret that “all have sinned and fall short of the glory of God” (Romans 3:23) and the “wages of sin is death” (Romans 6:23). If there is sin in our lives that means our spiritual lives are dead. Sadly, too many people are satisfied with being dead spiritually. We become complacent with what we are doing and feel there is no need to change. We need to wake up and see that our sin will only lead to death. Maybe not a physical death, but definitely a spiritual one that will last for all eternity. I’m thankful that God gives us a chance to live a spiritually healthy life. Right after Paul tells us that the wages of our sin is death, he reminds us about the gift of God; “For the wages of sin is death, but the gift of God is eternal life in Christ Jesus our Lord” (Romans 6:23). Sin leads us to spiritual death, but God leads us to eternal life. Paul described it this way, “Or do you not know that as many of us as were baptized into Christ Jesus were baptized into His death? Therefore we were buried with Him through baptism into death, that just as Christ was raised from the dead by the glory of the Father, even so we also should walk in newness of life” (Romans 6:3-4). It’s out with the old life of sin and in with the new life of Christ. Paul tells us that only happens through baptism. There is no better time than now to start living your life for God. As we transition from winter to spring, think of all the new life this earth is about to show us. Maybe God is trying to send you a message. You can start your new life today. It’s like spring cleaning for your soul.